The artwork above is a painting by Navajo artist David K. John, and hangs in my office. 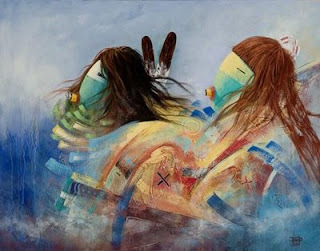 Titled "Rain Chanters," it depicts beings that are sacred to the Dine (the Navajo people), and which can offer healing assistance. It blesses the space where I see my patients. I am grateful for any feeling of help when working with my patients. To me this is a huge responsibility, and doctors, nurses, therapists, and other caregivers can easily feel overwhelmed. We're all the time trying to understand and solve others' problems. It sometimes amounts to what Dr. David Reilly of Glasgow Homeopathic Hospital in Scotland calls "fixitology". We act as if we think the patient is broken , needing to be "fixed" -- as quickly as possible ("quickfixitology"). Further, we reduce the person to body alone, leaving out his or her psychological, personal, inner world where both suffering and healing reside. Not only is this disastrous for the patient, but it's also a recipe for physician burnout. Imagine how it feels when someone enters our offices in pain (either emotional or physical) and asks for help? Imagine we've forgotten that the patient has any creative or self-healing resources of his/her own. After all, we're supposed to be "the doctor", know what's going on, and how to fix it. Turn up the heat. Sometimes we think we know, and we apply our medicines. Perhaps these seem to work, and the suffering is, for now, quieted. But is it really gone? We're sweating in our chairs, now. What happens when the patient doesn't respond as we hope, or has intolerable side effects? Or, what if we really don't know what to do from the start? We don't dare acknowledge that -- the shame and guilt are too horrendous. We work and work, trying to find answers. We want to help, but we think only perfect is good enough. Healthcare professionals soon resemble burnt toast. Ho'oponopono seems to pile on further burden by suggesting that, through our own erroneous memories, we are 100% responsible for our patients' suffering. Not only has medical reductionism already severed our patients from their own healing abilities, we have put ourselves in the "gotta-know-it-all" seat as physicians. Is it possible to feel any worse? Yikes! But wait. There's an opening -- and maybe more help than we'd ever imagine. In Ho'oponopono, we're only one "I'm sorry" or "I love you" away from coming back to Who We Really Are: connected at all times with Divinity (or Love, or the Creator, or any other term that feels comfortable for you). Peace and healing can bathe our weary souls. The updated Self-Identity through Ho'oponopono approach does see memories in us manifesting in our own, and our patients', problems. But through this repentance, forgiveness, and transmutation process we can free ourselves of these memory-related problems. Initiating this through "I love you" or other tools gives permission for Divinity to clear us, simultaneously lifting these memories presenting as problems from our patients too. Once clear, we are open to Divine Inspiration. Thank heavens. "When your Soul experiences memories replaying problems, say to them mentally or silently: "I love you, dear memories. I am grateful for the opportunity to free all of you and me." "I love you" can be repeated quietly again and again. Memories never go on vacation or retire unless you retire them." An added feature: Dr. Hew Len reminds us often that in working with patients, we're also taking on memories we share with their families, relatives, and ancestors. Scary, but maybe our work with ourselves can have even more far-reaching effects than first thought. All the more reason to "clean", too -- we don't really know what we're getting ourselves into, he says. Ho'oponopono in some ways is a paradox. We are 100% responsible for everything in our lives and in our offices. And yet, when we work from this very humble position, we're also open to greater assistance than any one human (MD or otherwise) could ever invoke. This also allows patients to bring forth their own healing capacities -- which are powerful and effective in themselves. We doctors can do what seems indicated, but from a clear, compassionate, and much less stressed starting point. It seems healthier for everyone, this way. I'm reminded of a story that has often been told about Morrnah Simeona, the Hawaiian kahuna who updated and taught Ho'oponopono all over the world for many years. Although given the gift of healing since age 3, she had apparently also been afraid to cross the street. It's said that she would imagine a gigantic hand extending from the sky, supporting and protecting her as she walked. For her, this made her way safe. Perhaps we all have access to that same Great Hand, if we choose. It comes in many languages, and many traditions. Thank you Morrnah, Dr. Hew Len, Mabel Katz, and Foundation of I for teaching, challenging, and reminding me. Thank you David John, for blessing my healing space with your beautiful painting and spirit.